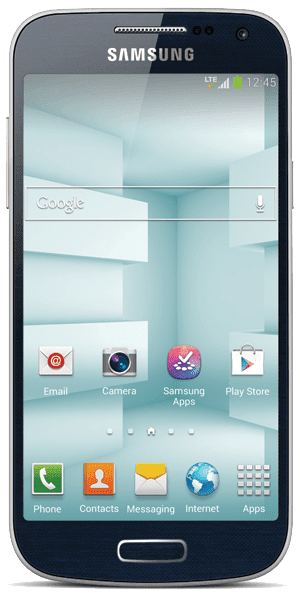 Whether you’re a parent of a teen that has “hinted” plenty times that they wish for a new smartphone under the tree this year or just in the market for a new phone that won’t break the bank, you must consider the Samsung Galaxy S4™ Mini. With its 8MP camera and compact design, beautiful and responsive display, and all the bells and whistles that the mini’s big brother the GALAXY S4 is known for, this would surely make the perfect gift! I am attached to my Smartphone! It’s like a part of me. Organization, social media, keeping in touch with loved ones, taking pictures (and tons of it! ), listening to music, reading, checking emails, everything! In this day and age, I feel it’s a necessity to have one (Yes teens, thank me now!). Compact design – The GALAXY S4 mini’s slim design makes it perfect to take with you anywhere, anytime. Premium experience – This device offers the same flagship experience as the GS4, including an 8MP camera, Group Play and Samsung Link. Powerful performance – The S4 mini packs a punch with a 1.7 GHz Dual Core Processor and the Android Jellybean 4.2.2 operating system. One of my biggest issues with smartphone these days is the grip and how big they are for little hands (like mine). Without my case on it, it would probably be kaput by now. This is one fantastic thing about the new Samsung Galaxy S4™ Mini. Even though it’s more compact than it’s “big brother”, it doesn’t compromise on it’s features and what it can offer. Sweet & Petite… with a powerful punch! Much like me. 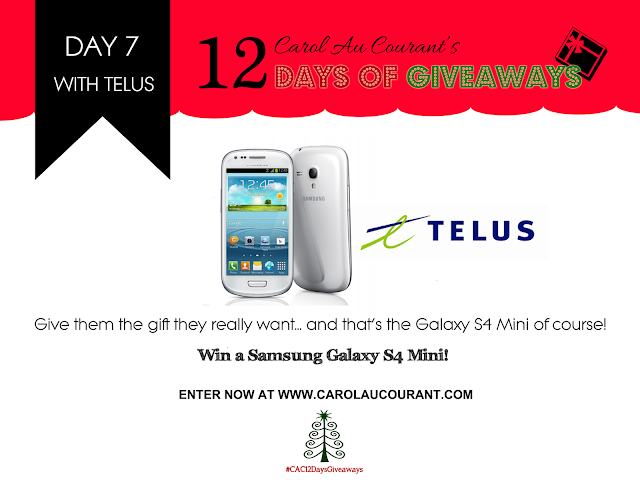 The Samsung Galaxy S4 Mini available at Telus for $0 on a two-year term or $400 outright. To learn more about the awesome Samsung Galaxy S4 Mini, click here. And for newbies that are still getting comfortable with their phones and have a ton of questions or worrying parents that are concerned about the online safety of their children (you just never know in this digital age! ), I absolutely love Telus’ unique Services: Telus Learning Centre and TELUS WISE®. Learning Centre sessions are great for tweens/teens or those just starting out with their first smartphone. Telus’ specialized Learning Specialist can give them a tailored one-on-one tutorial on how to use the phone so they are 100% comfortable using their new device – it’s great for parents too! They offer one-on-one or group sessions according to what you feel is best or most comfortable for you. Sessions range from 15 to 45 minutes depending on your learning style and what you would like to learn. I really wish they offered this when I got my first smartphone. I was so confused! And didn’t utilize all the great features I had after many months of owning it. TELUS WISE® is a great program for tweens and teens! Recently launched by Telus which is peace of mind for parents that are getting their kids on their first smartphone – it’s all about smartphone and Internet safety and how to teach kids to have a clean digital footprint. You can learn more about TELUS WISE® here. And psst… this service is a PTPA winner! Courtesy of the wonderful folks at Telus, one of you will win a new Samsung Galaxy S4 Mini! To enter, simply leave me a comment below telling me who in your family would LOVE this phone and why! My son would love this for playing ingress and for a cell. My hubby would love this for work and play. This phone would be great for my wife, who still uses a flip phone that looks like it was made 10 years ago. I’m sure my son would love this cause he loves cool new tech stuff! I would love this phone! Still using an old clunker! My sister-in-law is a phone addict and techie. She’d love this. I would love this phone as I would give it to my husband who has never had a smart phone – which leaves all family organising to me. My 12 year old daughter would love this for her starter phone! As a parent, I love the Telus Wise program! Me because mine is two years old and will not turn off when on and will not turn on when off…. I would love to win because I could use a new phone and I’ve had my eye on this one for a while!! My hubby would love this!!!!!! My husband would love this phone because he is still using an old freebie phone he got from telus when he first signed up with them about 6 years ago. I can’t help but giggle when I see him using it…it just looks so old fashioned! This phone would go straight to my sister in university who is currently using a flip phone! My husband would love this. He needs a new phone! I know that _I_ would love to own this. My husband has been talking nonstop about this thing since he first heard about it! I would most love this phone because mine is slowly dying. I don’t have a smartphone so I’d love to win it! I would love to win this! I’m desperately in need of a new phone. My husband would love this. he broke the screen on his S3 and and we couldn’t afford to replace it. It’s time that my husband and I learned how to use this technology. My mom…it’s time to upgrade her phone to something a little smarter! Me so I can keep in better contact with my stepkids! My dad because his phone is very early 2000 lol. Me, because I don’t have a phone. Meeeee because I have the oldest phone in the house! I would, because my cell phone is ancient and it would be great to have a phone that takes beautiful photo’s! I would as i need a new phone! my fiance because he loves having the newest electronic gadgets! Do I have to share it!? 🙂 I would like it for myself. My husband would. We don’t have a smart phone. me… need a new phone! I would love to win this for my husband. He is currently using his old LG Rumour, which is not a very reliable cell phone when he has to keep it plugged in to be able to use it lol. I would love to win this. I’m in need of a new phone, still have the flip phone. I think my father in law would LOVE this. He is always about the smallest phone, the newest phone, the newest technology. He would absolutely love this! we’d love to win this to gift to my brother-in-law this xmas!! Any of my older relatives because they could use one. Waving my wings, that would be me the tweeting Tooth Fairy!!! ☺ Keeping my wings crossed for the win! My sister would love this! She is always wanting the latest in technology! I would love this for my dad as he doesn’t have an android or iphone but instead an old phone without touch screen. Our phones are getting a little old – this would be great! Fo my husband, he deserves it! I would love to win this for myself,as I do not own a cell phone!!! My boyfriend because he loves Samsung!! My girls would love to have this! I would love to win this. I’ve been living the past 4 years with just a land line. My dad has never had a cell phone…I think it’s time! me! still using a flip phone! My husband needs a new phone because his is so old. My dad cause he’s the only one without a smartphone. My mom would love having this phone as a gift. I would love to win this to replace my existing phone! I’d love to win because I really need an upgrade! Myself because my blackberry is dying! My son would love this! He is a total techie! I would love to win this! My current phone has sticky keys – so sometimes I don’t get any t’s, e’s, r’s, a’s, s’s or d’s and sometimes I get three – and the slot for the memory card is toast so I’m almost out of storage space. Been dying to switch to an Android phone for the longest time… would love to win this! My Husband would love to get this under the tree! My husband would love this because he needs a great screen to see as he ages. My mother would as her phone is super old! My wife would love to win this. Right now her phone only half-works. It sometimes messages people in other languages! Ooooo, I would love to win this! I would love this because my phone keeps freezing and has not been working so well. I know I need a new one. I would love to win this! I tried the S3 but like you, it was too big for my wee hands. Made my hands cramp. Android phones are so user friendly. This looks great. Mememe…my phone is on it’s last legs! I would love to gift this to my local rescue centre. The phone they use is an old flip phone and they make lots of trips across SW Ontario to ferry dogs to adoptive homes. I wan them to be safe in the winter and know that someone cares. My husband would because his phone has issues and doesn’t work well. It spends most of it’s time with a dead battery. I would!! I’d love a new phone with an awesome quality camera and this one sounds unbelievable!! I would love to win this for my Mom! My son would love it. He dont have a cell phone yet but has been asking for one. My son would love it. He has started going out a lot more with his friends and volunteering with the cadets and it is always and it can be hard to get ahold of him, or have him get ahold of us when he needs a ride. My mom! She is in need of a cell phone and this one would do nicely! I would love to win. Presently don’t own a phone so this would be great. I would actually like it for myself. I have the oldest phone in the house! My wife would love this as she doesn’t have a smart phone yet! My husband. I just got a new phone, but he needs one desperately as well, and we can’t afford a second right now. We both love Android, and Galaxy is our phone of choice! My mom, because she’s better at Android than I am. My mom could totally use this.. best gift ever! My mom! She needs a phone and is not very techy so I think she can benefit from Telus’ learning centre session too. First time hearing about this and I’ve been with Telus for years! I totally need this phone badly! This would make the perfect gift for me! And I’m already with Telus! I love those services they offer too. My husband would love to have this phone as his current phone is old and cracked. I actually need a new phone.. The Samsung is perfect for the compatibility with the features on my Samsung smart TV. I also have an expiring plan with Telus .. Such a match made in heaven. I always have issues with too big smartphones and I have been eyeing this phone for a while now! Mine is ancient and I know this one would be perfect for me! Thanks!